Over the years I have purchased a wide assortment of dried beans. Each time I’ve used whatever I needed for a specific recipe, closed up the bag, and stacked it in the cupboard. Now, after several years, I don’t just have “some beans” in the cupboard, I have a BEAN CUPBOARD. Some people collect Precious Moments, and I collect dried beans. And still, I win. 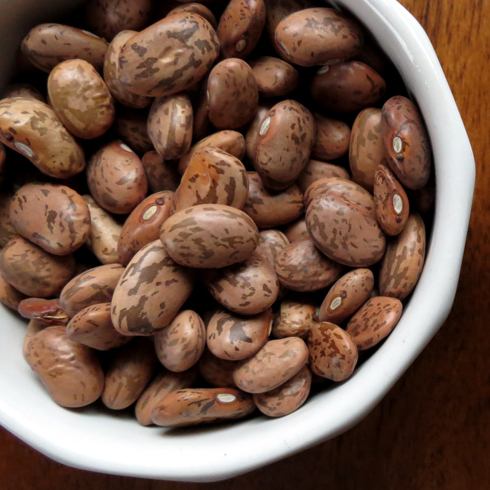 Dried beans are a great thing to have on hand, but using them requires a bit of planning. My favorite way to prep beans is to brine them. It just couldn’t be easier and consistently produces a tender and well-seasoned bean. Brining beans works basically like this: mix water and salt, add beans, let sit for good while, rinse, then cook. Done. And that’s exactly what I did when making this soup. In the morning I brined the beans and by the time I was ready to make the soup for dinner they were ready to go. 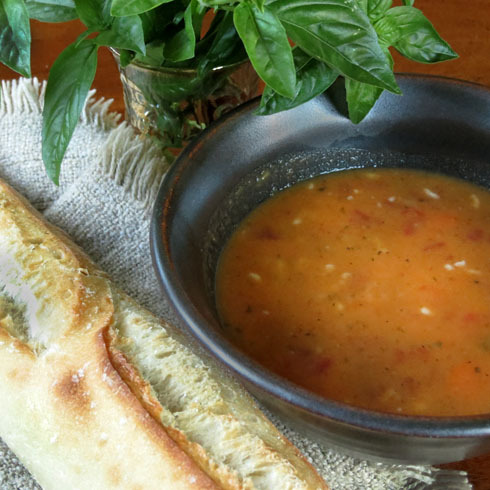 This soup is very hearty, flavorful, and tasty. It is stick-to-your-ribs thick, so feel free to add more stock or water to bring it to the consistency that you like. If you save it and reheat it, you’ll definitely want to add more water. Between the brining and the bacon, this is a fairly salty soup so be sure to give it a check before adding any more at the end. And although it doesn’t fit my official criteria for a low-calorie item, it comes in awfully close at 309 calories/serving. Plus, there’s bacon in it. In a large bowl, stir together water and salt until salt is dissolved. Add dried beans, and let sit at least 4 hours up to overnight. After soaking, remove beans from brine and rinse. Set aside. In a dutch oven, cook bacon over medium heat until crispy. Remove and set aside. Add onion and garlic, reduce heat to medium-low and cook about 5 minutes or until it is golden in color. Slowly add stock, scraping up the browned bits from the bottom. Increase heat, add beans, and bring to a boil. Reduce heat to a simmer, cover, and cook for 60 minutes or until the beans are tender. Using a potato masher, mash some beans to help thicken the soup. Crumble the bacon and add to the soup, add carrots, and cook covered for 15 minutes or until the carrots are tender. As part of my end of the season bounty, I have a big pile of slowly ripening cherry tomatoes. At the peak of the cherry tomato season, we’d easily polish off a bowl in an afternoon just as a wander-by snack. They were delicious eaten that way, but now that it’s the end of the season, they are a little more sour and less popular. And at this stage, the time between “almost ripe” and “super ripe” is pretty short. So, to boost the sweetness and encourage consumption, I decided to roast the tomatoes with a few of our favorite things and serve it up as a side. And. It. Was. Awesome. Unless you are my son, who says that the smell of rosemary can ruin a life. And of course, he is wrong. This dish could not be easier. Cut up a bunch of stuff, throw it in a covered casserole, put it in the oven, stir and serve. It would be excellent served with pork, chicken, turkey, or wild game. It is very versatile and packed with flavor. If you were cooking for a crowd, it would be easy to double – just increase the cooking time until the potatoes are tender. So easy, so delicious. You should make some. In a casserole dish combine potatoes through rosemary and season with salt and pepper. Cover and bake for 50 minutes. 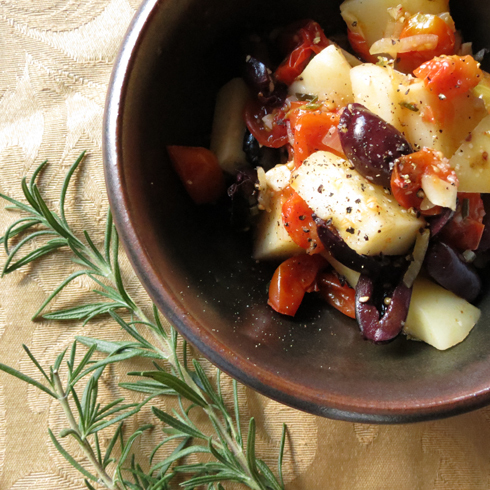 Remove from oven, stir in kalamata olives and set aside for 5-10 minutes. Season with salt and pepper if needed, and serve. Putting all three into play resulted in my go-to pie recipe, Caramel Apple Pie, which I loved so much I renamed it LOVE POTION NO. 9. If you have an abundance of apples or want to make someone fall in love with you*, I’d highly recommend it. Last year, thanks to the prolific apple tree in my parents yard, I DID have an abundance of apples. 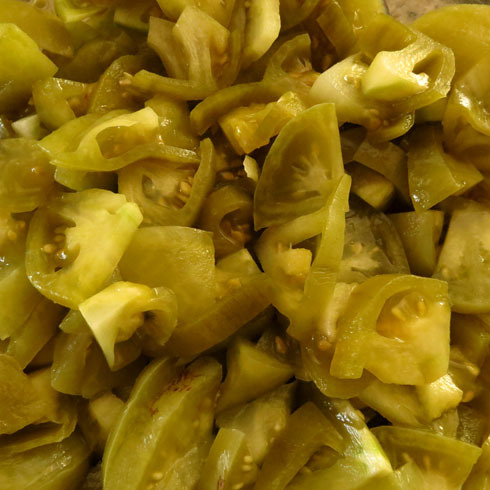 This year was not an apple producing year, however, so I thought that LOVE POTION TESTING would be out until my mom handed me a big bag of green tomatoes and mentioned Green Tomato Pie. Two seconds with Google told me that this Southern specialty might be the answer I was looking for to use up the green tomatoes and continue my scientific study. Although technically, green tomatoes can count as any unripened tomato, this is the best time of year to use them in this way. Earlier in the year, while the days and nights are still warm, tomatoes will do their best to ripen while on the vine. Once a frost hits though, the chances that they will sweetly ripen on the vine are pretty slim. It’s at this point that you can try to force them to ripen (best bet here is to leave them in a paper bag and check on them once in awhile to see if any are ready) or to embrace the green. The tomatoes force ripened are still better than the tomatoes you’ll find in a mid-winter Midwestern grocery store, but they lack the flavor and sweetness of a summer-ripened counterpart. My suggestion is to do a little bit of both, and with 2 lbs. of the green tomatoes, make yourself this pie. 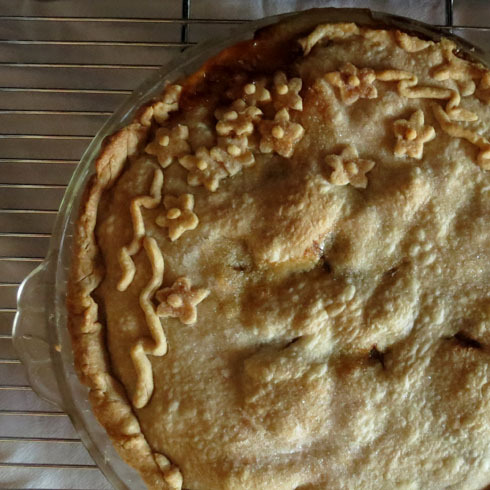 I was apprehensive about what a tomato would taste like when used in place of apples in a pie, but once I got over the thought of it, the flavor and texture proved to be awesome. I read that a few people said “you’ll never know it’s not apple!”, and I think that might be a bit optimistic. While the color and taste are not easily identifiable, I would not say that they are an apple dead-ringer. However, they were much sweeter and tastier than I’d expected, and all my other tasters agreed, helping to polish off this pie in two days flat. Preheat oven to 400° F. Remove prepared pie crusts from refrigerator and let sit at room temperature. Bring a large pot of water to a boil. Drop in the tomatoes and boil for about 3-5 minutes or until the skins split. Remove from water and cool. When cool enough to handle, remove as much skin from the tomatoes as possible. Cut off the stem end, quarter the tomatoes, and slice thinly. Place sliced tomatoes on paper towels and pat to remove excess liquid. Place tomatoes in a large bowl and add lemon juice, cinnamon, salt, flour and sugar. Set aside. In a small bowl, combine the first three ingredients for the caramel sauce and set aside. In a heavy saucepan, whisk together the sugar, brown sugar, and 1/3 cup water. Set over medium-high heat and cook for about five minutes. Remove from pan and whisk in the butter. Add the whiskey mixture and stir until everything is well mixed and smooth. Pour over tomato mixture and stir to combine. Transfer 1 dough round to a deep pie pan. Unfold and ease into pan, patting it into the pan. Pour tomato mixture into the pie shell. Unfold the second dough round and place over the top. Press the sides together to make a tight seal around the outside edges, and then cut 6-8 slits on the top of the pie. Sprinkle with remaining sugar. Bake until the crust is golden, for about an hour. Transfer to a wire rack and let cool for 1-1/2 hours before serving. – This is a saucy pie and while baking it can easily bubble over. I’d highly recommend placing a baking sheet underneath the pie while baking to catch any saucy drips. – Even with the store-bought crust, I still had trouble when rolling it out. So, Sophie and I made a few decorative patches for the crust in the form of flowers and vines to seal up the holes left behind by my poor rolling skills. I liked the look so much, I think I’ll do it again. It took very little time and made the pie look extra FANCY. – The first time I made the pie I used whiskey and the second time I used bourbon. My taste buds are not finely tuned enough to catch the difference when used in this recipe. I think either one is just fine. – Not all store-bought pie crust is non-dairy, so be sure to check the ingredients if non-dairy is important to your family. *never actual proven, but I love data and look forward to your research. Cooler days and school back in session means that the crockpot has returned to it’s semi-permanent position on my kitchen countertop. Hungry for some flavorful, slow-cooked food and eager to have food ready with little effort, I started searching around for some new recipes to try in the crockpot. I spotted a Tomato Basil Parmesan Soup on Pinterest that looked mighty tasty, the only problem of course, all that dairy. Looking through the ingredients, I figured that it wouldn’t be very hard to substitute the dairy for non-dairy counterparts, and while I was at it I decided to reduce the calories from the original version. With all new recipes, it feels like a real crapshoot whether anyone will eat it, let alone enjoy it. This recipe? Jackpot. Jackpot in the Crockpot. Creamy and slightly cheesy, the base of this soup tastes a tiny bit like the sauce in Chef Boyardee’s canned pasta, which normally would not make it a ringing endorsement in my book. HOWEVER, the kids totally loved it. And the more I had, the more I loved it too. Slightly rich, hearty, and low in calories, this soup might be one of our new favorite things. After replacing the dairy ingredients in the original recipe (butter, parmesan, half and half) with non-dairy counter parts (non-dairy butter, Daiya mozzarella, soy cream), I was worried that the resulting soup would not be thick and creamy enough. To make sure that the soup was not too thin, I added ingredients in two batches, pureeing the first half to create a thicker base. 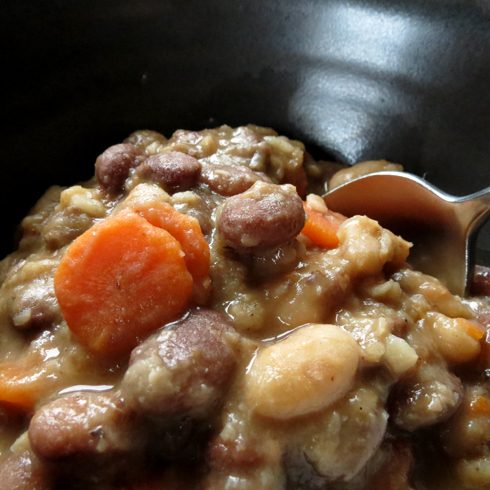 The resulting flavor and texture was terrific, helped to thicken up the soup, and allowed me to reduce some of the fat and calorie-laden ingredients (this recipe is about 35% lower in calories than the original). This recipe makes a pretty big batch of soup, which worked out great here because it has been requested for dinner and lunch several times. I’m not sure if it will freeze well, and this time, I won’t even have the chance to try. Add one can tomatoes, half the carrots, celery, onion, garlic, herbs, and chicken broth to a crockpot. Cook on low for 5 hours. After 5 hours, use a hand blender to puree the soup until no chunks remain. In a skillet over medium-high heat, melt butter. Add flour and cook for about 5 minutes. Add cream and stir until the flour mixture breaks up into the liquid and becomes a thick sauce. Add 1 c. of soup from the crockpot, stirring until well-combined. Add another cup of soup from the crockpot if any doughy chunks remain. When everything has been combined and the sauce has thickened, add to the crockpot and stir. Add remaining tomatoes, carrots, cannellini beans, and mozzerella, then stir to combine. Cover and cook for an additional hour. – If you would like to replace my non-dairy replacements with dairy versions, I’d recommend using butter, shredded part-skim mozzerella, and half and half in the same amounts noted here. On Sunday my mom loaded up a bag of goods for me that included a few leftovers and a big pile of lovely produce from her garden. For two days now I’ve snacked on mostly tomatoes with an occasional cucumber or green bean thrown in for variety. After a few days of all tomato meals, I decided I better dig into some of the other items she sent my way – and that included some smoked salmon. I know that I’m in the minority on this one, but I really hate leftovers. The only way I like to consume them is if I turn them into something new. 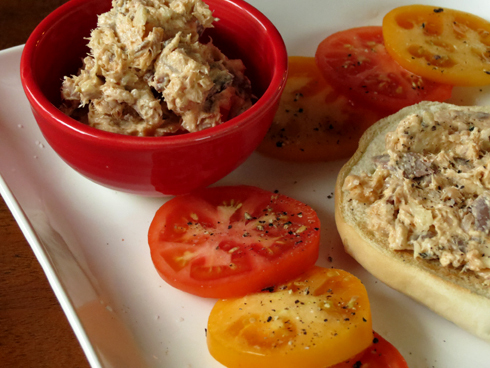 Like a caterpillar becomes a butterfly, leftover salmon transforms into delicious salmon spread. Really, it’s practically that poetic. There’s hardly anything easier than making salmon spread. Take all the ingredients, mix them together in a bowl, and serve. The spread is good on crackers, bread, bagels, and with veggies. Because I care about you very much, I feel that I should tell you that the combination of salmon and garlic will give you POWERFUL BREATH. In a bowl, combine all ingredients and mix well. Refrigerate for at least an hour to let the flavors come together. Serve on a bagel, with crackers or bread, or with veggies for scooping. In order to enjoy this recipe, you will need to love three things: 1) Lamb, 2) Bourbon, and 3) Mushrooms. I know a lot of people who do not care for at least one of the items on this list, which is why I decided to make it just for myself. As it turned out, it was for the best because I loved the sauce so much that I practically LICKED MY PLATE CLEAN. Bourbon cream sauce = boozy magical elixir. This recipe is easy and fast to make, with the added bonus that this is a one-pan meal. When cooking lamb in a skillet, it’s important to know that it can get a little bit smoky in the kitchen. So, I’d highly recommend making this dish on a night when you can throw open the windows or you run the risk of your kitchen looking like the CC Club, c. 1995. Now, let’s talk for a minute about lamb chops. There are all kinds of lamb chops. My favorite is the rib chop, cut about an inch in thickness, Frenched (that means with the bone, cleaned up a bit so that there is little or no meat on the bone). If you’re going to grill chops, some people like them a little thicker. Others prefer to have the chops butterflied, with no handle-like bone. Sometimes your butcher will give you options, sometimes they are already cut and you just have to decide that the cut available is the one you wanted. This recipe is based on my favorite cut of chop, with about 3 oz. of meat on each one and that estimate is generous. After cooking, each chop provides about 3-4 bites of lamb. Really, tasty, awesome bites. 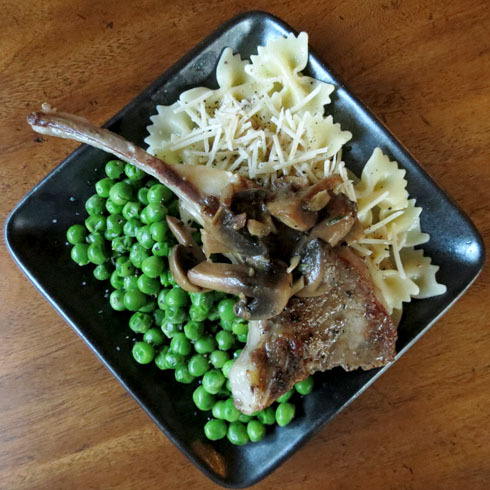 I served this dish with a side of farfalle and peas. It would be excellent with anything that can soak up some sauce, like garlic mashed potatoes, buttered egg noodles, spaetzle, gnocchi, a big slab of Texas Toast. Texas Toast probably doesn’t actually count as a side, but it sure would make a nice edible squeegee for your plate. Sprinkle the lamb chops with salt and pepper. Set at room temperature for about 10 minutes. In a large skillet, heat oil over medium high heat. When oil is hot, add lamb chops. Cook partially covered for about 4-5 minutes per side. Remove chops from the pan, set on a plate and cover. Reduce heat to medium-low and add onion and garlic, then cook for 1 minute. Add mushrooms and cook for 4 minutes, stirring frequently. Add bourbon and scrape the browned bits from the bottom of the pan. Cook for a few minutes and add the stock. Bring to a low simmer, adjusting the heat as needed. Cook until the liquid has reduced and has thickened slightly. Turn off the heat, and stir in creamer and thyme. Add salt and pepper to taste. Spoon mushrooms over chops and drizzle with sauce to serve. In Minnesota, there’s a slim space in time when fresh tomatoes are available. After making it through a long winter filled with mealy, flavorless tomatoes, homegrown tomatoes taste gloriously wonderful. If you are like me and your green thumb is actually plant poison, what you hope for is that someone in your family or one of your neighbors have a bumper crop of tomatoes and want to share their bounty. For the past few years, this has been the case, and almost nothing makes me happier. For a few awesome weeks, I will have a tomato at every meal. And I will be so happy. Last week, my mom loaded me up with treasures from her garden including cucumbers, green beans, and a bag full of tomatoes. Earlier in the day, I had also purchased a few yellow and pink tomatoes from the farmers market. And as they lined up like a tomato beauty pageant waiting to see who would be crowned, I pulled a few winners out of the queue and whipped up some dinner. This is a very simple and fast dish to prepare. 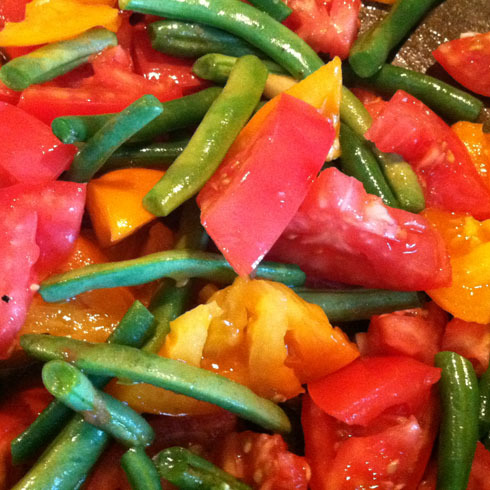 Wonderful as a side dish, or in my case the main course, the combination of tomatoes, green beans, and bacon is divine. Throw a little goat cheese on there and you can practically hear the archangels sing. For real. You can use any variety of tomato, but know that they cook down so the colors that show up when using non-red varieties are fleeting. But for those few moments, your pan will look really, really pretty. For my own dinner, I used pink and yellow tomatoes from the Tomato King (location: Albany, MN). If you’re lucky enough to spot his tomatoes at your local Farmer’s Market or co-op, grab a few. They are mighty fine. To start, I cooked up a little bacon until it was crisp, then removed it and set it aside until it was cool enough to crumble. In the meantime, I added the veggies and a little garlic wine to help sauce it up and add some flavor. This was my first time using a garlic wine and it might be one of my new favorite things. Made at the Crow River Winery (location: Hutchinson, MN), the wine is light in color and packed with roasted garlic flavor. Added to this dish, it gave a nice, mild, and slightly smoky garlic flavor. If you don’t have any garlic wine on hand (which is a very likely scenario), feel free to use another wine or water in its place (see notes below). For those of you who love making foods ahead (hey mom! ), this dish is excellent reheated. For best results, add the bacon and goat cheese after reheating. As a side, I’d definitely recommend this with pork, BBQ, or any grilled or smoked meats. As a main dish, I’d recommend grabbing a big bowl. Serving size: 1 to 1-1/2 c.
In a skillet over medium to medium-high heat, cook bacon until crispy. Remove from pan and set aside to cool. Reduce the heat to medium low, add green beans and garlic to the pan and cook for 1 minute. Add tomatoes and cook for 2 minutes. Add wine, crushed red pepper, salt and pepper. Reduce heat to low and cook uncovered for about 20 minutes. Divide mixture between plates or bowls. Top with goat cheese and crumbled bacon. Serve. 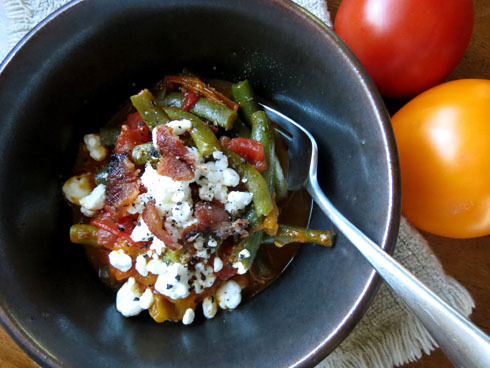 – Although this was a really great way to use fresh produce, this is the kind of dish that would also be pretty good in the winter, using frozen green beans and canned, diced tomatoes. It would not be as fresh tasting, but the flavors would hold up really well as a tasty winter side. – Don’t have any garlic wine? You could substitute any wine. Red will give it a full flavor, white will be a bit crisper. I’d stay away from any sweet wines for this one. – If you’re a vegetarian, substitute the bacon for some olive oil. The flavor will be different, but it will still be quite tasty. – Need to make it non-dairy? Simply omit the goat cheese or top it with a dollop of non-dairy sour cream. I LOVE lamb and am lucky enough to have a pretty good supply of it in my freezer. Right now, I have quite a few packages of ground lamb and they are practically burning a hole in my apron pocket. Last week, I gave lamb burgers a try. While I found the flavor delicious, they did not hold a nice flat patty shape, and instead puffed up like giant meatballs. They were tasty, but a little hard to eat. So this week when I decided to give it another go, I thought dude, why fight it. This recipe is super easy, takes just a few minutes of prep, and only a few more to cook. 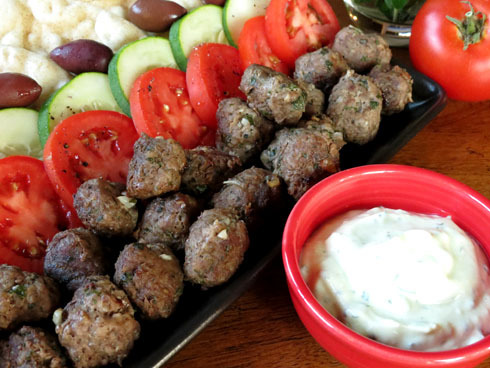 I served the meatballs with a some sides – pita bread, tomatoes, cucumbers, and kalamata olives – and a healthy serving of Herbvocado Sauce. The meatballs make a tasty dinner but would also be great to serve as appetizers. Everybody loves meatballs! Well, not my kids, but that might have more to do with the MEATBALL OVERDOSE OF 2007 more than anything else. In a bowl combine together ground lamb, garlic, herbs, salt and pepper, until the herbs and garlic are evenly distributed. Form meatballs about the size of a small superball (little bigger than a quarter in diameter). This should make about 30-32 meatballs at this size. Over medium heat, place meatballs in a large skillet and partially cover. Cook for about 5 minutes and turn. Reduce the heat to medium low and cook for an additional 5 minutes, then turn. Cook for another 1-3 minutes until the meatballs are cooked all the way through. Take care not to overcook or they will get a bit dry. Remove the meatballs from the skillet and set on a paper towel covered plate to soak up some of the grease. While the meatballs are cooking, make the sauce. In a food processor add avocado, garlic, mayo, and lemon juice. Pulse until starting to blend together. Add Greek yogurt and pulse until smooth. Remove from food processor and add herbs, stirring until well mixed. Add salt and pepper to taste. Serve meatballs with a side of sauce. In the past few years, Greek yogurt has gone from relatively unknown to everybody’s food BFF. It’s in EVERYTHING. And while I like the way it tastes with a little fruit and honey, I find it to be way too sour for my taste to eat it plain. Even when used in place of sour cream in recipes, it still seems a too sour. BUT, it is so packed with protein and low in calories that I keep trying to find ways to work it into my diet. And you know what makes everything better? No, this time the answer is not bacon, but bacon’s championship counterpart THE AVOCADO. Creamy and fat tasting, an avocado proved to be just what the Greek yogurt needed to help counter the sourness. With a garden-load of fresh herbs staring me in the face, I decided to throw some in to add flavor and texture to the sauce. 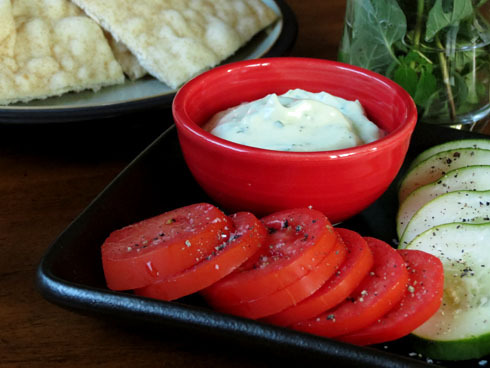 The result is a thick, flavorful, healthy, protein-packed dip. Describing it to my son, he said that Greek Yogurt Sauce with Avocado and Fresh Herbs would take so long to say that no one would want to eat it. He said that if it were him, he’d give it a better name. Herbs + Avocado = Herbvocado. Kid named, mom approved. So far, I’ve used this sauce as a dip for vegetables, meatballs, and to top a burger. It would be great used in place of ranch or blue cheese and served with hot wings. Add a little water to the dip to thin it out and it would make an excellent salad dressing or a sauce drizzled over grilled vegetables. It is versatile, light, and delicious. In a food processor add avocado, garlic, mayo, and lemon juice. Pulse until starting to blend together. Add Greek yogurt and pulse until smooth. Remove from food processor and add herbs, stirring until well mixed. Add salt and pepper to taste. – The amount that this recipe makes will vary slightly based on the size of the avocado. – Each 1/4 c. serving of this dip contains around 3.5 g of protein. That’s as much as half an egg a 1/4 c. of cooked beans! For dip! Last night I joined my neighbors for their annual Beer and Cheese party. I knew I wanted to bring something featuring homemade cheese, but I also knew that I wouldn’t have a lot of time to putter around with anything complicated. In trying to figure out what to make, I may have stumbled on my new go-to appetizer recipe. 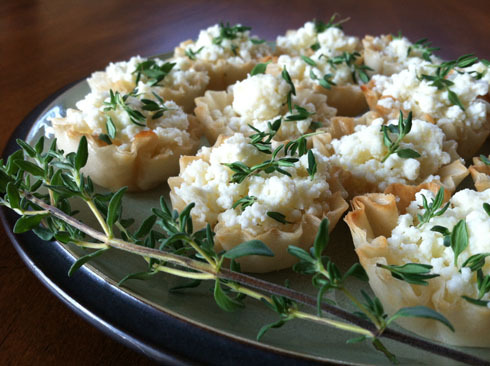 Phyllo Cups with Ricotta, Honey and Thyme – you are tasty and make me look fancy. Honestly, it just does not get much easier than this recipe (especially if you skip making the ricotta from scratch). With four ingredients and a few minutes of time, you can have a beautiful plate of slightly sweet appetizers. Bite-sized, these cups are easy to eat, low in calories, and full of delicious flavor. They would be great as appetizers, a nice brunch addition, or served with some fruit for dessert. And, they look really, really beautiful on a plate. For this batch, I made my own ricotta. I can see at least one of you rolling your eyes from here (hey mom!). It is worth noting that you absolutely do not need to make ricotta from scratch for this recipe; store-bought ricotta will be perfectly fine. However, if you’ve had any interest in making your own cheese, I would highly recommend starting with ricotta. Of all the cheeses I’ve made so far, ricotta is the easiest and requires the least amount of equipment, patience, or special equipment. I’ve used a recipe from Cooking Light with great success. This time, I used whole milk instead of the 2% that the recipe called for. The cheese was much drier than I’ve made in the past, so next time I’d stick with the 2% as I preferred the consistency and would rather save those calories for something else. The only effort in this recipe is in the assembly, which from start-to-finish is probably under 5 minutes. The phyllo cups can be filled ahead of time, but I would not recommend doing it more than an hour or so before eating. The cups soften slightly over time, and the honey soaks into the cheese the longer it sits. The flavor is still the same, it just looks a little bit prettier when you can still see the honey drizzled on the top. Thaw frozen phyllo cups at room temperature for 10 minutes. Spoon a heaping teaspoon of ricotta into each up. Drizzle cups with honey and sprinkle with thyme leaves. Serve cold or at room temperature.